I can smell this guitar. It smells like Chesterfield Kings and real old money-- lots of it too! This is a seriously and very severely original '59 Hardtail with an asking BIN of $28.9K. Most of the screws are original, the pickguard is hangin' together by hope and there's some crazy fret wear on what could even be the original frets. I'm surprised there isn't some guitar swami out there who reads fret wear and tells fortunes. 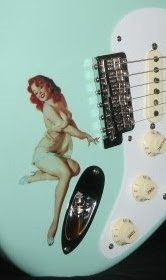 The two owners of this guitar would have interesting readings! The listing has tons of photos, including dissection pics for authentication purposes. It weighs in at under 7# and you can see the ash grain thru the finish in a couple pics. God, I can smell it! Cough! Seller: oliviasvintage 100% Top Rated eBay Seller. 4700+ positive feedbacks!!! Check out the rest of their listings!